This is it! Bishop vs. UNCANNY X-FORCE! 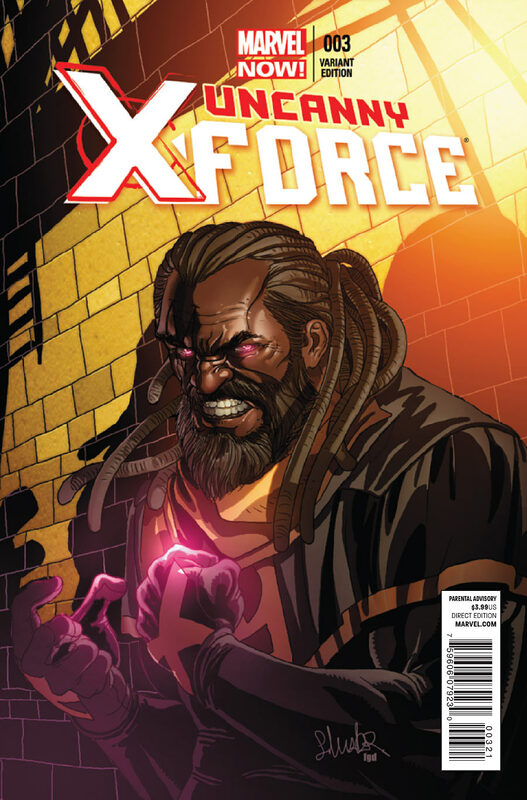 Bishop has amazing new powers that help him take down X-Force. But how did Bishop get these new powers? 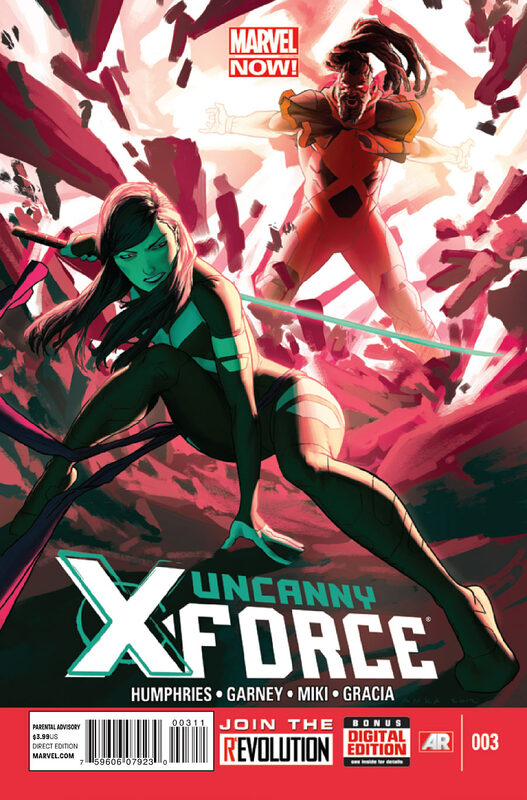 Cover- The standard cover shows Psylocke crouching in the foreground bathed in green hues while Bishop hangs in the background, crazed, psychotic and explosive bathed in hues of red and pink. The artwork is also far superior to the interiors making this cover a major spotlight. The alternate over shows a close up shot of Lucas Bishop eyes and fists glowing in his trademark pink hue while his santa clause beard and dreads frame his crazed and twisted features. This is also a very good cover but the standard is slicker by far. 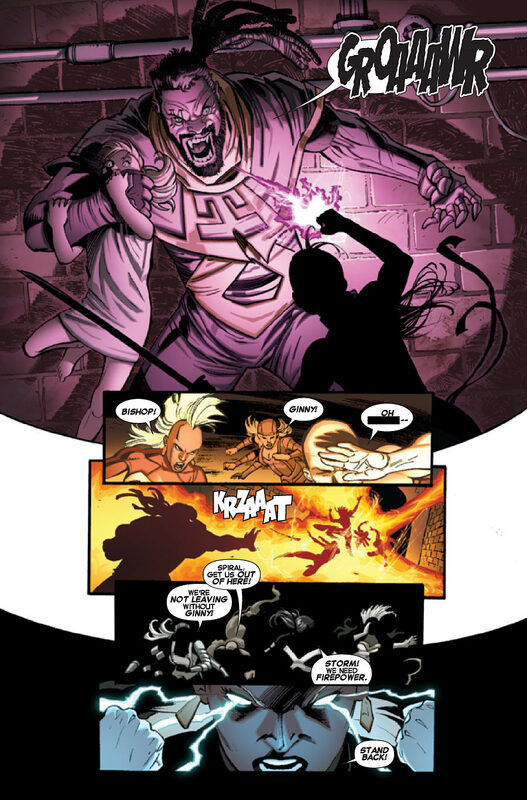 Action– Storm, Psylocke, Spiral and Puck vs Bishop was executed pretty well as he showed why he’s such a formidable villain. I also found the venue for the fight inspired and exciting as it added to the tension and excitement is just about every way. Art- For the most part this book looks good. The stylized mindscape of Bishop is very noteworthy and arguably the best looking parts of this book. Black Hero-Anti Hero Bishop is back and…weirder than ever. He’s feral and very deadly, I dig it but what’s really going on here? He’s displayed long fangs and fingernails, all but blocking telepathic sensing and blitzing speed. What the hell happened to him in the future? Storm meanwhile continues to be the mother hen she is while attempting to steer the team towards more heroic ends. Mystery- What the hell is going on with the three Fantomex’s and their fascination with Psylocke? How does this play into the new team? Team- This issue we learn why Spiral is earth bound and we also learn how she met the new mutant in her care who Bishop is hell bent on killing. This new development also explains why Spiral would join this team after everything she’s done in the past. Puck also has his personality shine through explaining his inclusion being the level headed by the book member, Storm meanwhile is majestic and motherly while Psylocke takes charge of the team like she was born for it. Art- Terribly inconsistent, some panels are vividly detailed while others look like they were cobbled together. Drawn out- Sorry but as much as I’m enjoying things I can’t help but think this initial arc has dragged on for far too long. Three issues in and the new team has not been formed, our villain’s motivations are still a mystery and we have no idea what direction this book is supposed to be taking.